I couldn’t wait for the annual Sicilian Feast to come to Florence, because it’s the only place outside of Palermo and Brooklyn where I can find one of life’s most addicting comfort foods…..the panelle panino. And so, I will take a momentary diversion from my Florentine life to write about something terribly un-Tuscan. 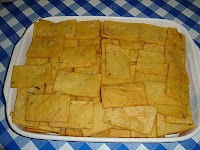 A “panella” is a lusciously light, flat fritter made with chickpea flour, water, salt, and parsley. After being deep-fried, a sizzling stack is topped off with a generous heap of fresh ricotta fresca and slivers of ricotta salata and immediately placed inside a hot semolina toasted sesame roll. The fusion of warm, nutty and cheesy flavors, punctuated by the contrasting crunchy and creamy textures, makes for a categorically indulgent, albeit calorically decadent panino. Try it only once and become addicted. 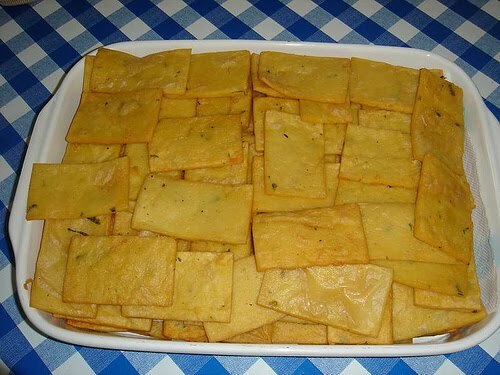 Panelle are eaten as simple street food in Palermo, made and sold at outdoor "friggitorie" stalls, but otherwise only found in heavily populated Sicilian communities such as Brooklyn, New York where it is sadly on the verge of extinction. Making panelle is not only an art, but a profession in and of itself. 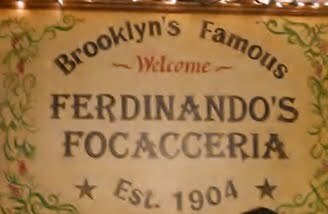 Panelle-makers are called “panelleri”, and they are a dying breed in the U.S.
Lunching on panelle sandwiches at Ferdinando’s Focacceria on Union Street in Brooklyn was a weekly childhood ritual. Owned by Sicilian immigrants, the Buffa family has been in business for over a century. 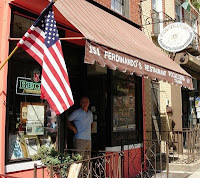 It is perhaps the only surviving panelleria in the U.S. It is my first essential stopover on any trip to New York. Living in New York I could go to Ferdinando’s whenever I craved panelle. And I needed my regular fix. Upon moving to Southern California, I quickly learned the futility of trying to make it myself, after many failed attempts. It requires precision, experience, skill. A little research led me to discover a tiny Sicilian eatery in San Diego’s Little Italy, where Bruno was the only surviving west-coast panellaro. This provoked an incurable weekly habit of driving 120 miles round-trip just for a panelle sandwich. Until one day taken by the urge, I drove to San Diego, desperately salivating for an entire hour, only to find that Bruno had died, and along with him, my weekly fix. Selfishly saddened, I was curious to know why someone else couldn’t make them. While I drooled from the mouth like a wolf ready for the kill, Bruno's brother Tony explained why nobody else but Bruno was capable of making this humble but precious Sicilian fodder. Rrrrrr….the better to eat you, my dear. I bared my fangs and went for his neck. He explained to me the history and secrets to its preparation. Arabic in origin, it is a poorman’s fare. The ceci bean, plentiful in Sicily, is easier to harvest than wheat, cheaper and more protein-nutritious than pasta. The recipe seems painfully simple….farina di ceci, water, salt and parsley, but the method is truly an art. Similar to polenta, the mixture is thickened by stirring constantly for 45 minutes. When the paste starts to pull from the sides of the pan, (the critical moment) it is removed and placed in cylindrical containers and left to harden. The secret is in knowing exactly when to remove the paste from the pot. If you wait too long, it becomes unpliable. It must be sliced into flat squares as soon as it cools down, no longer, then deep-fried at the precise temperature until golden brown and MUST be eaten at once. This is not “take-out” food. The panelle becomes gooey, chewy and soggy if not eaten immediately. After searching all of southern California to find ceci flour and finally finding it at Claro's in Tustin, I attempted to make it myself. But numerous attempts proved useless. Either I ended up with a gummy paste or a limp lump of goo that exploded all over the kitchen as I dropped it into the hot oil. I gave up and set my hopes upon the Sicilian Sagra which was coming to Florence in November. Anticipating the Sicilian feast with famished fervor, I attended the opening parade and perused the multiple food booths, building up for the final climax. I waited my turn on a long line of customers and ordered my panelle sandwich. To my utter dismay, the panelle were pre-made and reheated. My heart fell. Delusa and totally depressed, I brought my soggy, overpriced panelle sandwich to a picnic table where others were eating rice balls and fried calamari as costumed performers danced and played the accordion. Skeptical, I bit in and sunk my teeth into to the highly suspicious gooey, chewy, tasteless concoction and almost cried. 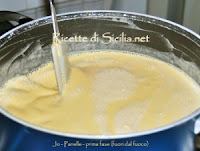 I later found out that the mixture was mass-produced in Vicenza, frozen and delivered that morning. Time to go to Ferdinando's.